Read Italian fairy tales from the ancient collection, Stories from the Pentamerone, as well as from Andrew Lang and others. Jump to full list of Italian fairy tales. 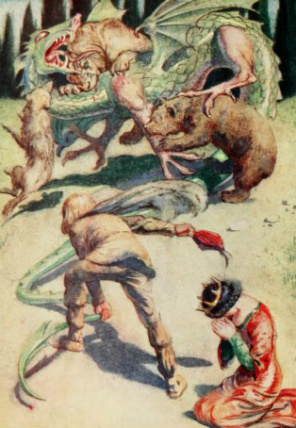 The princess and the horrid dragon.” Illustration by Morris Meredith Williams from The Italian Fairy Book, published 1911. About: Some Italian fairy tales, folk tales and legends can be traced back thousands of years, and similarities between stories are found in French, Spanish and Celtic traditions as well. The abundant collection of Italian folk tales we have today comes to us from contemporary written accounts of Medieval Italian folklore. Gianfrancesco Straparola published a collection of fairy tales in Italy during the 1500s that were also published in France; thus, crossing cultural and political borders. In the mid-1600s, Giambattista Basile recorded some of the earliest literary versions of fairy tales in his Pentamerone, also known as Stories from the Pentamerone. The collection was published by his sister after his death. Other authors would later draw from his collection for inspiration including The Brothers Grimm. Andrew Lang included many Italian stories in his Rainbow Fairy Books. Italo Calvino’s collection of Italian Folktales from the 1950s remains a popular reader for young and old alike, and is one of the most comprehensive collections available today. Embedded within Italian fairy tales are proverbs, jokes and anecdotes that reveal the unique regional and cultural characteristics found across Italy. A favorite style of narrative found in Italian folklore is called the Fabliau. This was a humorous style that often poked fun at clergymen or others in authority. The stories were centered around ridiculous situations and plot lines with the main character as a buffoon. With the rise of Catholicism in Italy, many pagan traditions were replaced or masked over with religious icons and customs. This form of sympathetic magic can be found in Italian legends and fairy stories as old pagan medicinal practices merged, for example, with prayers to saints, and other interesting concoctions that allowed the two practices to co-exist and find new life in fairy stories and legends. Not all Italian fairy tales were originally intended to be children’s stories, but with translations and adaptations that toned down the more gruesome or horrific elements, they found their way into the hearts of children the world over. Many popular tales like Cinderella, Snow White, and Sleeping Beauty were based, albeit loosely, on true events.